The demand in the global market for underwater monitoring system in the oil and gas industry is projected to experience a CAGR of 6.43% during the forecast period of 2017 to 2025. 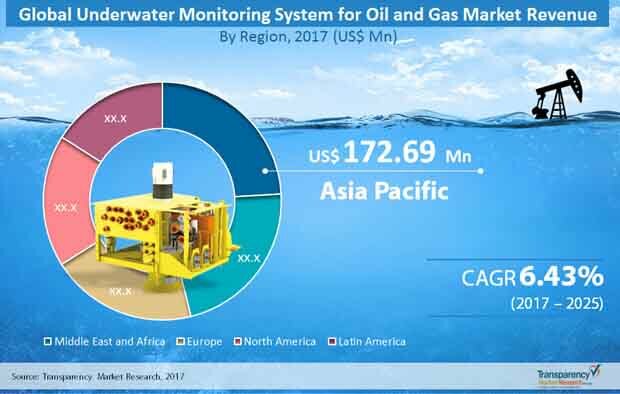 The global worth of the underwater monitoring system market in the oil and gas industry is estimated to be worth US$1881.3 mn by 2025, substantially up from its evaluated worth of US$680.0 mn in 2016. The growing need to monitor oil and gas reserves in deep sea explorations, complexities in the operation and maintenance of subsea systems, increase in offshore deepwater and ultra-deepwater explorations, rise in economic viability of deepwater developments, and implementations of strict safety regulations are some of the key factors driving the demand in the global underwater monitoring system in oil and gas market. On the basis of subsea sensors, the global underwater monitoring system for oil and gas market is segmented pressure sensor, proximity sensor, temperature sensor, flow sensor rotation sensor, linear displacement gauge, and inclinometers load sensors. Riser technology, pipeline type sensors, and flexible pipe systems are another sub-segments of subsea sensor segment. In 2016, pressure sensors and riser technology accounted for the most prominent demand-share, which was a reflection of essentiality of the sensors and the technology respectively. By monitoring systems, the global underwater monitoring system for oil and gas market is bifurcated into acoustic sensors, wireless sensor networks, and satellite radio navigation segments. Acoustic sensor category is further divided into acoustic underwater vehicle (AUV), acoustic doppler current profiler, sonobuoys, and hydrophones. The responsibility of acoustic sensors is to calculate the position, store, and transmit the information obtained from subsea equipment. The sensors are distributed over the submarine infrastructure and subsea pipeline. Wireless sensor segment is also further classified into 3G/GPRS Communication Module, RTU, and SCADA. In 2016, the SCADA sub-segment contributed 65% share of wireless sensor segment. By communication method, the market is classified into frequency division multiple access (FDMA), time division multiple access (TDMA), code division multiple access (CDMA), and space division multiple access (SDMA). The FDMA communication method is anticipated to hold more than 35% market share throughout the forecast period. Out of all the major regions studied by the regions for their potential of underwater monitoring system for oil and gas market, Asia Pacific currently serves the maximum demand, followed by The Middle East & Africa and Europe. Due to the massive projects undertaken by world’s large oil and gas companies for exploration and production operations in Myanmar, China, and is likely to fuel the demand for underwater monitoring equipment based applications in Asia Pacific over the forecast period. China is also the key manufacturer and consumer of sub sensor products in Asia Pacific region. The development of the offshore fields in the region with the new discoveries of oil and gas fields in the areas of South China Sea, Australia such as are expected to witness drilling activities. Underwater monitoring system equipment demand would continue to increase in Asia Pacific region over forecast period. The region Asia Pacific is accounted for more than 24% share in 2016. Middle East and Africa, North America and Europe are also developed market for Oil and Gas underwater monitoring equipment market are expected to expand at a moderate pace during the forecast period. Some of the most prominent players currently operational in the global underwater monitoring system for oil and gas market are: Schlumberger-OneSubea, Kongsberg Maritime, Teledyne Marine, SONARDYNE, Fugro, Ocean Sonics, DSPComm, KCF Technologies, and Mitcham Industries. This report analyzes and forecasts the market for Underwater Monitoring System for Oil and Gas market at the global and regional level. The market has been forecast based on revenue (US$ Mn) from 2017 to 2025. The study includes drivers and restraints of the global Underwater Monitoring System for Oil and Gas market. It also covers the impact of these drivers and restraints on demand for underwater monitoring systems during the forecast period. The report also highlights opportunities in the Underwater Monitoring System for Oil and Gas market at the global and the regional level. The report comprises of the detailed value chain analysis, which provides a comprehensive view of the Underwater Monitoring System for Oil and Gas market. Report also includes Porter’s Five Forces model for the market to help and understand the competitive landscape in the market. The study encompasses market attractiveness analysis, wherein end-users are benchmarked based on their market size, growth rate, and general attractiveness. The report provides the estimated market size of underwater monitoring system for oil and gas for 2016 and forecast for the next eight years. The global market size of underwater monitoring has been provided in terms of revenue. Market numbers have been estimated based on Subsea Sensor, Monitoring System, and Communication method segments of underwater monitoring market. Market size and forecast for each of major Subsea Sensor, Monitoring System, and Communication method have been provided in terms of global and regional markets. Secondary research sources that are typically referred to include, but are not limited to company websites, annual reports, financial reports, broker reports, investor presentations, and SEC filings, internal and external proprietary databases, and relevant patent and regulatory databases, national government documents, statistical databases, and market reports, news articles, press releases, webcasts specific to companies operating in the market. Oil and Gas journal, International Trade Administration, wireless sensors market with Communication method in Oil and Gas Primary research involves e-mail interactions, telephonic interviews, and face-to-face interviews for each market, Subsea Sensor, segment, and sub-segment across geographies. We conduct primary interviews on an ongoing basis with industry participants and commentators in order to validate the data and analysis. Primary interviews provide firsthand information on market size, market trends, growth trends, competitive landscape, and outlook, etc. These help validate and strengthen secondary research findings. These also help develop the analysis team’s expertise and market understanding. The study provides a decisive view of the global Underwater Monitoring System for Oil and Gas market by segmenting it in terms of Subsea Sensor, Monitoring System, and Communication method. These segments have been analyzed based on present and future trends. Regional segmentation includes the current and forecast demand for the underwater oil and gas monitoring systems market in North America, Europe, Asia Pacific, Latin America, and Middle East & Africa. The report also covers demand for subsea sensor, monitoring system, and communication methods segments in all the regions. The study includes profiles of major companies operating in the underwater monitoring system market. Key players of the market include KCF technologies, BMT group, Fugro, Schlumberger-one Subsea, Sonardyne,Konsberg maritime, Bowtech products, and ocean sonics. Market players have been profiled in terms of attributes such as company overview, overall revenue, business strategies, recent developments, and SWOT analysis.